I have worn the Peace Mala bracelet with honour and pride now for three years since coming across this wonderful and necessary organisation at a Theosophical Summer School. As I travel the world many have asked about the bracelet. What struck me about the Peace Mala is its Universality, Simplicity of message and Clear symbol; a message that can speak directly to the heart of every human being without comment. The mind with its prejudices, divisions and separations cannot argue or subvert such a clear message. Our future is in the hands of our young people. It is with our wisdom our opportunity to gift this understanding of peace to future generations and I look forward to the day when all National flags and symbols of separation are replaced with the rainbow, simply because, we are, all one family. And the world will be as one' - (John Lennon) Imagine. Ron Wallwork is a Senior Sports and Leisure Consultant Architect currently involved in the 2015 European Games in Azerbaijan after involvement in the successful Olympic 2012 games in London. 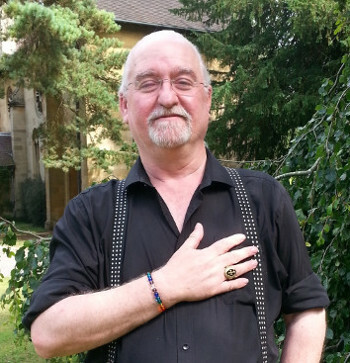 Ron is also a practising Gnostic, a Member of the Theosophical Society, a writer, lecturer and an artist.